February 12, 2018 By: Abu-Bakarr Sheriff Esq. The late JUSTICE EDMOND K. COWAN was my maternal uncle. His younger sister, my mother – ELIZABETH TELLU – would always talk about her illustrious elder sibling, BRA EDMOND, while we’re growing up in Kenema. To her and the rest of the family from Panguma, Foindu, Bunumbu and Kenema, BRA EDMOND was the shining light and shield. In the years leading to the outbreak of the war in 1991, lawyers were a rare gem in society. To have one, and a prominent one at that in the person of the late man, accorded respect to any family. So, while growing in Kenema, neighbours would talk about our lawyer uncle with admiration and reverence. But it was not until Uncle Cowan was posted to Kenema in 1993 as Resident Judge that my siblings and I had the opportunity to meet and interact with our famous uncle more regularly and up close. His presence in Kenema, no doubt, increased the respect neighbours and anyone who cared to listen had for our family. Such was the place of eminence Uncle Cowan had in our family that his giant stature and colossal influence served as a big roof we could all shelter under. Hence his shocking death, albeit at 81, came as a debilitating blow to all of us. The shock stems from the fact that he still maintained lucidity and agility until his sudden passing. We thank God that his passage to eternity was swift without any painful long illness, although the news dealt a fatal blow that would take long to heal. 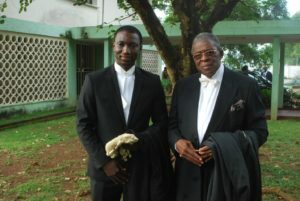 Our consolation, though, is that he etched his name boldly in the annals of history in our beloved Republic: as a Private Legal Practitioner and State Counsel; Legal Advisor and Board Secretary at the Sierra Leone Produce Marketing Board; Judge of the High Court and Justice Court of Appeal; Speaker of Parliament; Ombudsman; and Chairman of an 80-man Constitutional Review Committee. I have been a regular visitor to his residence over the past year; during some of those visits we spent hours together as he narrated his struggles as a young man growing up in Freetown, a foreign student in England, and upon his return as a private legal practitioner in Bo & Freetown. As I reflect on our discussions, the reality dawns on me that our family has lost a giant, whose vacuum no one may fill, perhaps for generations. But I’m pleased by the fact that millions of our compatriots and scores across the world are also celebrating the life of an eminent Judge, a respected Speaker of Parliament in the Second Republic, an impartial Ombudsman and a fearless Chairman of a Constitutional Review Committee that is still unmatched in our country’s history. Both in life and death, Uncle Edmond has more admirers than enemies. No doubt we shall always remember his positive contribution to the family and country. He is dead but he will remain immortal to every generation to come. Goodbye Uncle Cowan! Rest in Peace Bra Edmond!